Conducting copper wire insulated by an outer layer of polyethylene. An insulator, also called a dielectric or nonconductor, is a material that resists the flow of electric current. This type of material is used in parts of electrical equipment intended to support or separate electrical conductors without passing current through itself. The term is also used more specifically to refer to insulating supports that attach electric power transmission wires to utility poles or pylons. Some materials, such as glass or Teflon, are very good electrical insulators. A much larger class of materials, for example rubber-like polymers and most plastics, are still "good enough" to insulate electrical wiring and cables even though they may have lower bulk resistivity. These materials can serve as practical and safe insulators for low-to-moderate voltages (hundreds, or even thousands, of volts). Electrical insulation is the absence of electrical conduction. An insulating material has atoms with tightly bonded valence electrons. According to electronic band theory (a branch of physics), a charge will flow through a material whenever there are states available into which the electrons in the material can be excited. This allows them to gain energy and thereby move through the conductor (usually a metal). If no such states are available, the material is an insulator. Most (though not all) insulators are characterized by having a large band gap. This occurs because the "valence" band containing the highest energy electrons is full, and a large energy gap separates this band from the next band above it. There is always some voltage (called the breakdown voltage) that will give the electrons enough energy to be excited into this band. Once this voltage is exceeded, the material ceases being an insulator, and charge will begin to pass through it. However, it is usually accompanied by physical or chemical changes that permanently degrade the material's insulating properties. Materials that lack electron conduction must also lack other mobile charges as well. For example, if a liquid or gas contains ions, then the ions can be made to flow as an electric current, and the material is a conductor. Electrolytes and plasmas contain ions and will act as conductors whether or not electron flow is involved. Nonconductors suffer from the phenomenon of electrical breakdown. When any voltage applied across a length nonconductor exceeds a threshold breakdown field for that substance, the nonconductor suddenly turns into a resistor, sometimes with catastrophic results. During electrical breakdown, any free charge carrier being accelerated by the strong e-field will have enough velocity to knock electrons from (ionize) any atom it strikes. These freed electrons and ions are in turn accelerated. One carrier creates two, which create four, etc. Rapidly the nonconductor becomes filled with mobile carriers, and its resistance drops to a low level. In air, the outbreak of conductivity is called "corona discharge" or a "spark." Similar breakdown can occur within any nonconductor, even within the bulk solid of a material. Even a vacuum can suffer a sort of break down, but in this case the breakdown or vacuum arc involves charges ejected from the surface of metal electrodes rather than produced by the vacuum itself. 110 kV ceramic insulator, showing sheds. Suspended wires for electric power transmission are bare, except when connecting to houses, and are insulated by the surrounding air. 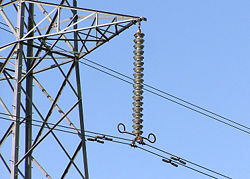 Insulators are required at the points at which they are supported by utility poles or pylons. Insulators are also required where the wire enters buildings or electrical devices, such as transformers or [circuit breaker]s, to insulate the wire from the case. These hollow insulators with a conductor inside them are called bushings. Amongst the first to produce ceramic insulators were companies in the United Kingdom, with Stiff and Doulton using stoneware from the mid-1840s, Joseph Bourne (later renamed Denby) producing them from around 1860, and Bullers from 1868. A utility patent was granted to Louis A. Cauvet on July 25, 1865 for a process to produce insulators with a threaded pinhole. To this day, pin-type insulators still have threaded pinholes. A wide variety of telephone, telegraph, and power insulators have been manufactured. For some, they have become collectors' items. Insulators used for high-voltage power transmission are made from glass, porcelain, or composite polymer materials. Porcelain insulators are made from clay, quartz or alumina and feldspar, and are covered with a smooth glaze to shed dirt. Insulators made from porcelain rich in alumina are used where high mechanical strength is a criterion. Porcelain has a dielectric strength of about 4-10 kV/mm. Glass has a higher dielectric strength, but it attracts condensation and the thick irregular shapes needed for insulators are difficult to cast without internal strains. Some insulator manufacturers stopped making glass insulators in the late 1960s, switching to ceramic materials. Recently, some electric utilities have begun converting to polymer composite materials for some types of insulators. These are typically composed of a central rod made of fiber reinforced plastic and an outer weather shed made of silicone rubber or EPDM. Composite insulators are less costly, lighter in weight, and have excellent hydrophobic capability. This combination makes them ideal for service in polluted areas. However, these materials do not yet have the long-term proven service life of glass and porcelain. Cap and pin insulator string (the vertical string of discs) on a 275 kV suspension pylon. Puncture voltage is the voltage across the insulator (when installed in its normal manner) which causes a breakdown and conduction through the interior of the insulator. The heat resulting from the puncture arc usually damages the insulator irreparably. Flashover voltage is the voltage which causes the air around or along the surface of the insulator to break down and conduct, causing a 'flashover' arc along the outside of the insulator. They are usually designed to withstand this without damage. High voltage insulators are designed with a lower flashover voltage than puncture voltage, so they will flashover before they puncture, to avoid damage. Dirt, pollution, salt, and particularly water on the surface of a high voltage insulator can create a conductive path across it, causing leakage currents and flashovers. The flashover voltage can be more than 50% lower when the insulator is wet. High voltage insulators for outdoor use are shaped to maximize the length of the leakage path along the surface from one end to the other, called the creepage length, to minimize these leakage currents. To accomplish this the surface is molded into a series of corrugations or concentric disk shapes. These usually include one or more sheds; downward facing cup-shaped surfaces that act as umbrellas to ensure that the part of the surface leakage path under the 'cup' stays dry in wet weather. Minimum creepage distances are 20-25 mm/kV, but must be increased in high pollution or airborne sea-salt areas. Higher voltage transmission lines use modular cap and pin insulator designs (see picture above). The wires are suspended from a "string" of identical disk-shaped insulators which attach to each other with metal clevis pin or ball and socket links. The advantage of this design is that insulator strings with different breakdown voltages, for use with different line voltages, can be constructed by using different numbers of the basic units. Also, if one of the insulator units in the string breaks, it can be replaced without discarding the entire string. Standard disk insulator units are 10 inches (25.4 cm) in diameter and 5 3/4 in. (14.6 cm) long, can support a load of 75 N (15 klbf), and are rated at an operating voltage of 10-12 kV. However, the flashover voltage of a string is less than the sum of its component disks, because the electric field is not distributed evenly but is strongest at the disk nearest to the conductor, which will flashover first. Metal grading rings are sometimes added around the lowest disk, to reduce the electric field across that disk and improve flashover voltage. Often a broadcasting radio antenna is built as a mast radiator, which means that the entire mast structure is energized with high voltage and must be insulated from the ground. Steatite mountings are used. They have to withstand not only the voltage of the mast radiator to ground, which can reach values up to 400 kV at some antennas, but also the weight of the mast construction and dynamic forces. Arcing horns and lightning arresters are necessary because lightning strikes to the mast are common. Guy wires supporting antenna masts usually have strain insulators inserted in the cable run, to keep the high voltages on the antenna from short circuiting to ground or creating a shock hazard. Often guy cables have several insulators, placed to break up the cable into lengths that are not submultiples of the transmitting wavelength to avoid unwanted electrical resonances in the guy. 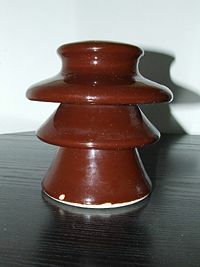 These insulators are usually ceramic and cylindrical or egg-shaped (see picture). This construction has the advantage that the ceramic is under compression rather than tension, so it can withstand greater load, and that if the insulator breaks the cable ends will still be linked. These insulators also have to be equipped with overvoltage protection equipment. For the dimensions of the guy insulation, static charges on guys have to be considered, at high masts these can be much higher than the voltage caused by the transmitter requiring guys divided by insulators in multiple sections on the highest masts. In this case, guys which are grounded at the anchor basements via a coil—or if possible, directly—are the better choice. In older apparatus made up to the early 1970s, boards made of compressed asbestos may be found; while this is an adequate insulator at power frequencies, handling or repairs to asbestos material will release dangerous fibers into the air and must be carried out with caution. Live-front switchboards up to the early part of the twentieth century were made of slate or marble. Electrical wires may be insulated with polyethylene, crosslinked polyethylene (either through electron beam processing or chemical crosslinking), PVC, rubber-like polymers, oil impregnated paper, Teflon, silicone, or modified ethylene tetrafluoroethylene (ETFE). Larger power cables may use compressed inorganic powder, depending on the application. Flexible insulating materials such as PVC (polyvinyl chloride) are used to insulate the circuit and prevent human contact with a 'live' wire—one having voltage of 600 volts or less. Alternative materials are likely to become increasingly used due to EU safety and environmental legislation making PVC less economic. Class 1 insulation requires that the metal body and other exposed metal parts of the device is connected to earth via a "grounding" wire which is earthed at the main service panel; but only basic insulation of the conductors is needed. This equipment is easily identified by a third pin on the power plug for the grounding connection. Class 2 insulation means that the device is double insulated. This is used on some appliances such as electric shavers, hair dryers and portable power tools. Double insulation requires that the devices have both basic and supplementary insulation, each of which is sufficient to prevent electric shock. All internal electrically energized components are totally enclosed within an insulated body that prevents any contact with "live" parts. They can be recognized because their power plugs have two pins, or on three pin plugs the third (earth) pin is made of plastic rather than metal. In the EU, double insulated appliances all are marked with a symbol of two squares, one inside the other. 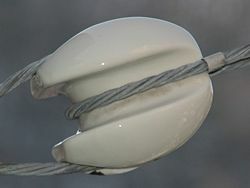 Insulators are commonly used as a flexible coating on electric wire and cable. Since air is a nonconductor, no other substance is needed to "keep the electricity within the wires." However, wires which touch each other will produce cross connections, short circuits, and fire hazards. In a coaxial cable, the center conductor must be supported exactly in the middle of the hollow shield in order to prevent EM wave reflections. And any wires which present voltages higher than 60V can cause human shock and electrocution hazards. Nonconductive coatings prevent all of these problems. In electronic systems, printed circuit boards are made from epoxy plastic and fiberglass. The nonconductive boards support layers of copper foil conductors. In electronic devices, the tiny and delicate active components are embedded within nonconductive epoxy or phenolic plastics, or within baked glass or ceramic coatings. In microelectronic components such as transistors and ICs, the silicon material is normally a conductor because of doping, but it can easily be selectively transformed into a good insulator by the application of heat and oxygen. Oxidized silicon is quartz, i.e. silicon dioxide. In high voltage systems containing transformers and capacitors, liquid nonconductor oil is the typical method used for preventing sparks. The oil replaces the air in any spaces which must support significant voltage without electrical breakdown. ↑ Patent number 48,906. Reference Insulators Info. Retrieved February 16, 2009. ↑ Electrical Porcelain Insulators. Universal Clay Products, Ltd. Retrieved February 16, 2009. ↑ "Insulator Usage, A.C. Walker's Insulator Information." in Cotton, H. 1958. The Transmission and Distribution of Electrical Energy. London, UK: English Univ. Press. Retrieved February 16, 2009. ↑ Holtzhausen, J.P. High Voltage Insulators. IDC Technologies. Retrieved February 16, 2009. ↑ Adam Junid, Overhead Line Insulators. Knol. Retrieved February 16, 2009. ↑ Leonard L. Grigsby, The Electric Power Engineering Handbook (Boca Raton, FL: CRC Press, 2001, ISBN 0849385784). Gibilisco, Stan. 2005. Electricity Demystified. New York, NY: McGraw-Hill. ISBN 0071439250. Tipler, Paul Allen, and Gene Mosca. 2004. Physics for Scientists and Engineers, Volume 2: Electricity and Magnetism, Light, Modern Physics, 5th ed. New York, NY: W.H. Freeman. ISBN 0716708108. Young, Hugh D., and Roger A. Freedman. 2003. Physics for Scientists and Engineers, 11th ed. San Francisco, CA: Pearson. ISBN 080538684X. US Glass Insulators Reference Site. National Insulator Association - US site. Teleramics - specializes in UK telegraph insulators with a railway bias. Insulator Patent Reference Library - Contains over 2,800 US patents relating to electrical insulators and related items. Online Museum for Hemingray Glass Company items. This page was last modified on 3 March 2018, at 21:55.